If there is one thing I am somewhat mindful of in this hobby (or obsession if we’re being honest) relating to pens, their associated inks, and paper — it is the cost of feeding the habit. I am not even speaking of bigger ticket items such as a quality fountain pen or leather-bound notebook — simply those everyday stationery purchases we often make. Of course relative to that new pen purchase, a notebook or notepad remains fairly cheap by comparison, irrespective of brand or manufacturing quality. Although your standard A5 (No. 16) Rhodia pad may come in at AU$7.00 – $8.00, and even the A4 variant only AU$13.00 – $14.00, things can go skyward pretty quickly when stocking up on a few “essentials”. Like many, I have boxes and drawers filled with a collection of such products ready to be called into action when the inclination or need arises. That being the case, why the need to seek out lower end options? A valid question, and I often ask myself whether I have become someone who buys something just because it is cheap — regardless of quality. However I can assure you I do have some standards, and only search for, test out, and put into ongoing use the products which although may not be perfect, will at least pass those minimum standards and be enjoyable and satisfying to use. I am certainly not going to put up with poor paper just because it was a bargain, spending my writing time cursing at the ink feathering or nib catching on cheap, rough paper. At times I’ve actually found certain features in some of the cheaper options have suited me a little better than some of their higher priced cousins. Let’s face it though, there is a certain amount of satisfaction to be gained in finding some local, readily available alternatives which reduce the rate at which I burn through those more “premium” products. I do acknowledge I am lucky enough to have access to many retail outlets given I work in the Brisbane CBD. All of the products here were simply bought off the shelf, and if available online, result in additional postage charges, rendering them less of a budget buy. I do feel for those of you unable to simply walk by in your lunch break, drop a few gold coins and walk out with a notebook or two. As always, my intention is not to sell these products to you — merely to report in on how I found them to be valid options which are a little easier on the budget. All three I purchased myself, and I have no affiliation with any of the manufacturers or retailers. This notebook has been in daily use for the past month or so, and performed extremely well at the task. As you can see the cover is a little worn. “Daily use” generally involves blog post drafts, coffee tasting notes, general notes or song lyrics rewritten to test out a pen or ink. Many and varied content, however a common theme being longhand writing — often several pages at a time. Design wise, the Kokuyo Campus series comprises a selection of thin, glue bound (external tape reinforced) notebooks unadorned with any additional pockets, closure straps or the like. They actually remind me of a standard school exercise book in many ways (perhaps with the exception of the better paper quality). The cover is simple card stock, which is not overly thick however does the job as intended. Not having used any of the Japanese made Campus line of notebooks before, the quality of the paper was certainly pleasing, though not a complete surprise given listings with online retailers noting the paper to be decidedly fountain pen friendly. 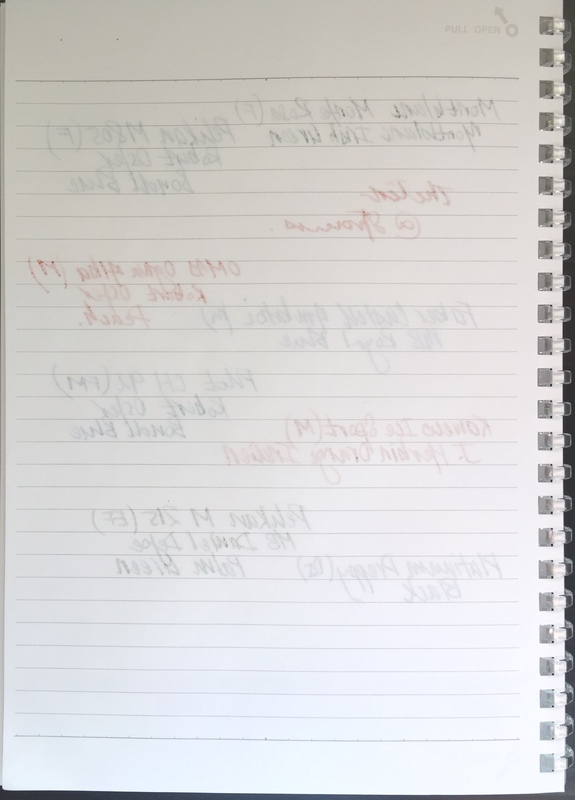 The 70 gsm paper handled my daily writer (typically M or F) fountain pens with aplomb, showing no feathering, bleed through, nor ghosting of any significance. Writing is almost as smooth as you’ll find anywhere — great paper for most fountain pens. With a 0.7 mm Retro 51 refill, the show through was just a touch more evident, however as always I also put this down to my heavier hand when using rollerballs or ballpoints. The slightly off white paper shade provides a perfect canvas for true ink colour representation, and dry time is comparable to, if not better than some of the heavier weight papers — dependent on ink type of course. 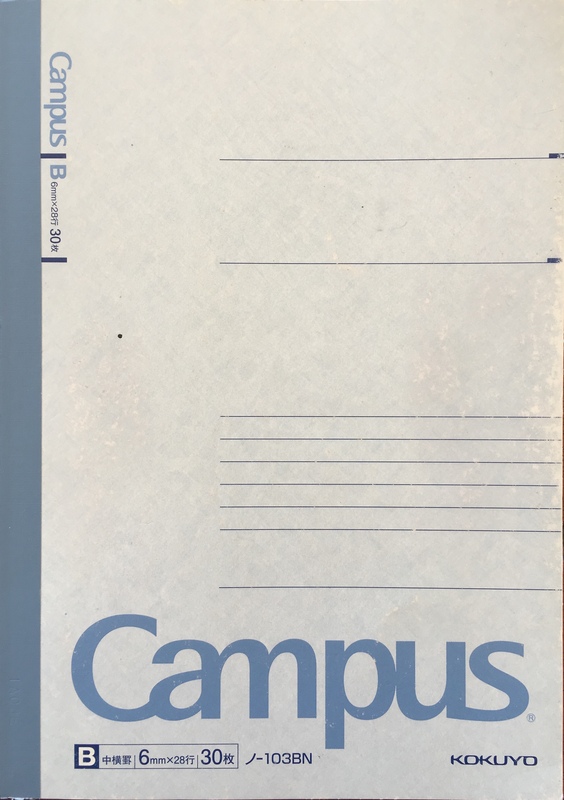 The Campus line of notebooks comes in various sizes in plain, ruled or grid options, and the pre-printed No., Date and bold title lines at the top of the page are a nice touch. Although my numbering always goes in the bottom right corner of each right hand page, other indexing or notations can always take advantage of the field provided at the top. The model I’ve been using contains ruling at 6 mm spacings, with contains additional 7 mm markings along the top and bottom lines for reference in the vertical plane. Overall I am very impressed with this thin, light, high performing notebook, and if there were any negatives, it is probably only the binding, which is beginning to stretch a little in the initial pages. I suspect I have contributed to this by regularly (and unnecessarily) bending the book back on itself to then lay it flat for writing — probably not the best habit given running the heel of my hand up the open book would achieve the same result. Coming in at 60 pages, I imagine most will have this notebook filled and move on before any real issues are seen with the binding, however it is perhaps best to take at least a little care. I’ll certainly be buying from the Campus line of notebooks in the future, and if you haven’t already — I’d highly recommend at least trying them out. For the princely sum of AU$2.80, there is not a lot to lose, and as far as I’m concerned is quite the bargain for what you get. Side Note: The design and evolution of the Campus series of notebooks is also an interesting story. This particular purchase was driven by the need for a “correspondence” notebook or notepad which was fountain pen friendly, contained tear off sheets, and was a little larger than an A5 Rhodia No 16 notepad. The specific reason for this being I write a good portion of the letters I send during my lunch break, and often do so sitting at the bar of my favourite cafe in the CBD. Said bar is fairly narrow from front to back, and not therefore suited to the Rhodia A4 sized pad I had been using. Having resorted to the A5-sized Rhodia No 16 instead, ideally I wanted something in between to fill the void, with a B5 sized notepad was of course the way to go. 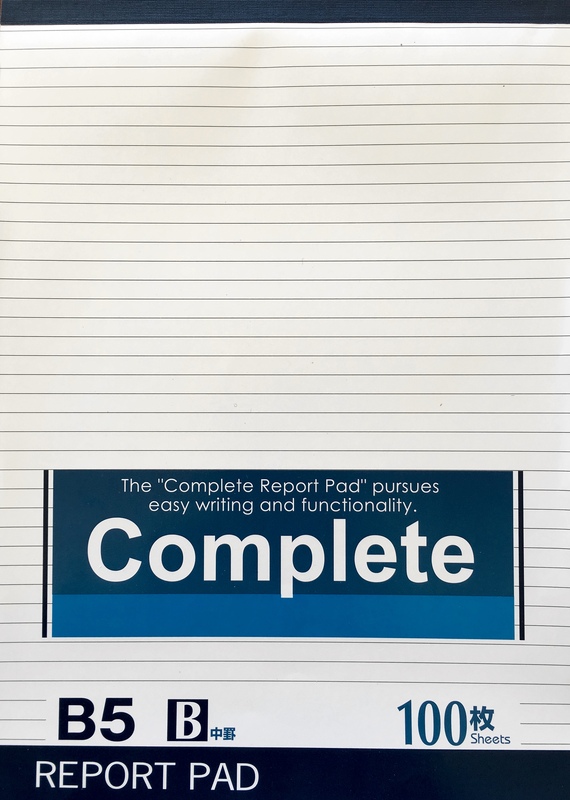 The Complete Report Pad is an Indonesian made B5 tablet style notepad sold through Daiso, and as noted above — for a bargain basement price. The top binding is again glue with tape reinforcing, and allows straightforward tearing of sheets from the pad once completed. The front cover is your standard glossy, slightly thicker paper stock, with the rear thickened cardboard. Both do their respective roles as intended, however the front cover is not designed for very rough use. Of course the most important aspect is the paper. Ruled at 6 mm spacings, the pages also sport a title bar along the top, containing pre-printed Date and No. fields. There are also 6 mm divisions marked at across the top and bottom-most line of each page. The ruling and printed divisions/fields appear on the front facing side of the page only, with the intention of single-sided use. I’ve not been able to find specifications as far as the weight of the paper is concerned, however a reasonable estimate would be in the order of 70 gsm or so. Whether this is correct or not I am not sure, however the performance is certainly comparable to papers around that type of weight. Writing performance is very, very good for the price you pay for this notepad. It is not dissimilar to the Kokuyo paper I’ve described above, yet is marginally toothier to the feel. Again I’ve used numerous fountain pen nib types (M and finer) and inks with no problems. A small amount of ghosting with no bleed through; feathering is non-existent; and the overall feel of the paper provides a pleasant writing experience. I’d still describe this paper as being relatively “smooth”, yet of course it is not your Rhodia or Clairefontaine. There really isn’t too much more to say about this one. For my intended purpose of finding an appropriately sized correspondence notepad, The Complete Report Pad is just about perfect. For the price you can pick these up for, they are exactly the sort of thing to grab a few and leave them in the various places you may jot down a few words or as I do — write a letter. Wonder if they’ll let me leave a stack on the end of the bar? Here is where I’ve really upped the ante, with the 30 page Aqua Drops Twist Ring notebook thundering through the register at a cost of AU$4.70 — almost double the price of the two mentioned above. To me it is still considered a budget option, though in the same store you can pick up a Rhodia No 16 Notepad for a list price of AU$7.16. 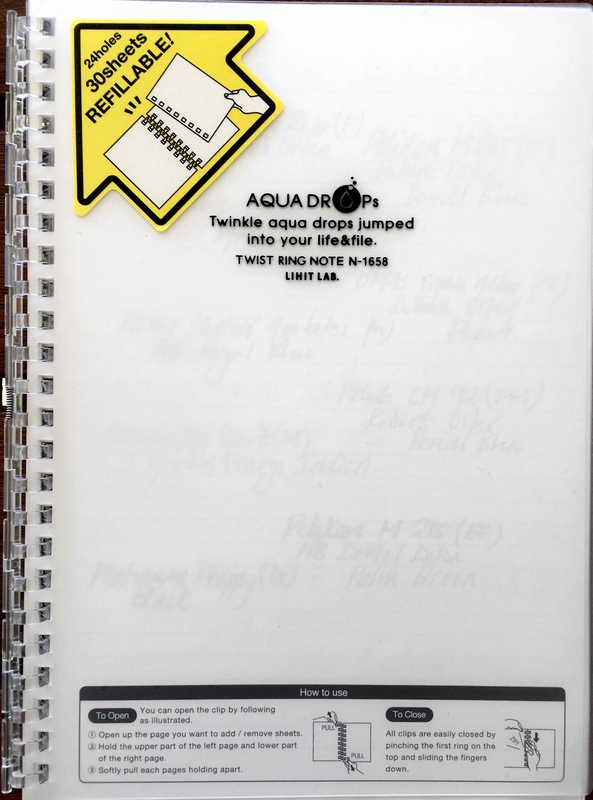 There is also a B5 sized Aqua Drops notebook listed at AU$5.00 — agin for 30 pages. The choice here though is not necessarily just price, but some of the utility gained in features of the Aqua Drops Twist Ring — namely the fact it is easily refillable, and those refills can be obtained in plain, ruled or grid loose leaf sheets. A packet of A5 refills will set you back AU$2.95, so in effect, once the notebook is purchased you have endless refills at a similar cost to the products above. I’ve mentioned the B5 size, and refills for this size are AU$3.50. 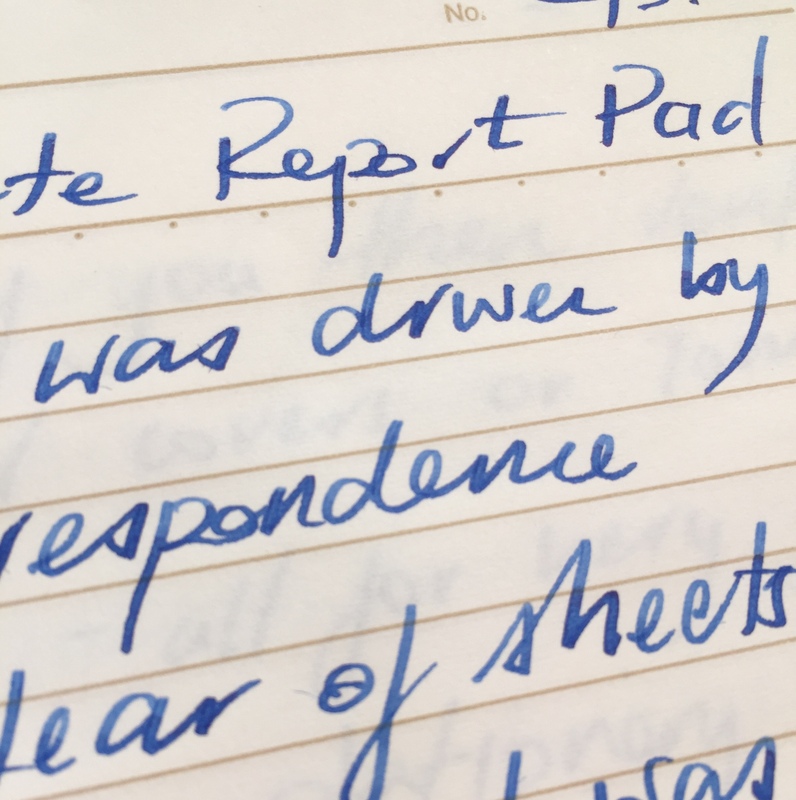 Although the utility of refilling and/or rearranging sheets in this notebook is probably the main drawcard, the writing performance is right up there as well. This is super smooth 70 gsm paper, and any nib or tip will glide happily across its surface. All of your ink colours will shine on the white paper, and while the lines are not overly dominating, aren’t quite as light as the Campus notebook. 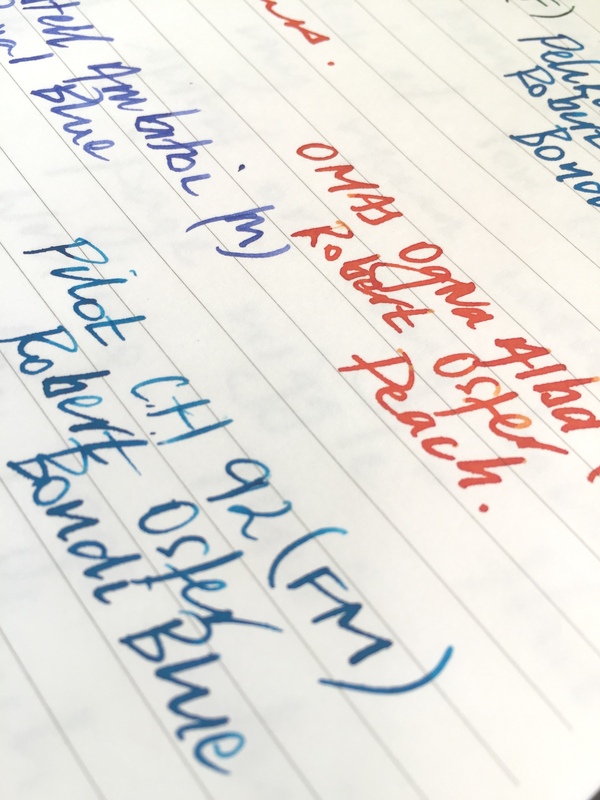 If you are a heavy fountain pen user, and use a lot of broader nibs combined with wetter inks, the paper is probably not going to be up to scratch for double-sided use. However for my medium nibs and finer, the only negative is a little ghosting on the reverse of the page. There is no bleed through or feathering to be seen at this end of the nib spectrum, however my European mediums were right on the cusp of feathering with certain inks. 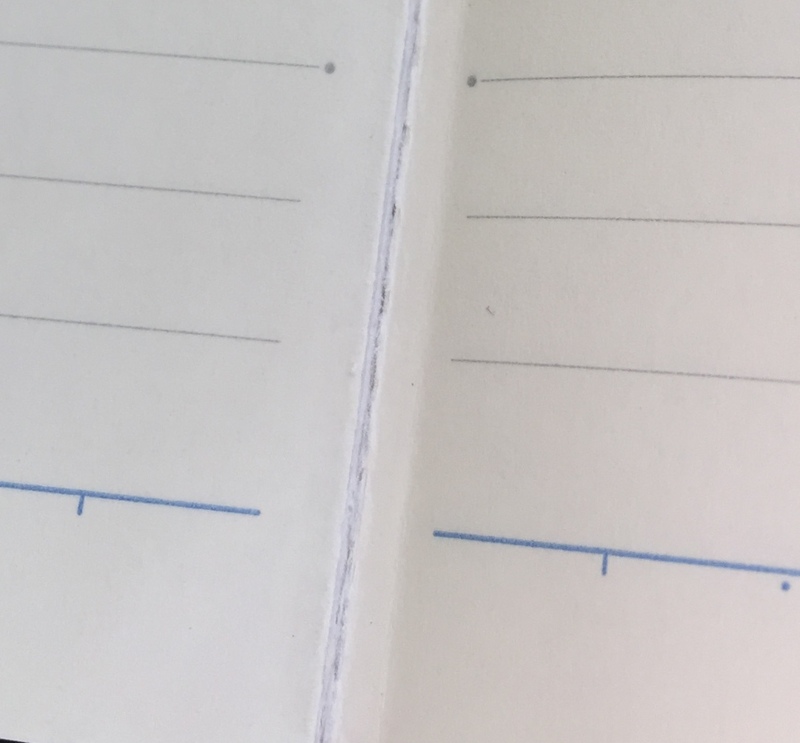 The refill system is quite straightforward, with a tug on the top and bottom of the page adjacent to the spine when the notebook is open, popping apart the rings. I’ve not had the product long enough to comment on the longevity of the plastic spirals, however they seem strong enough. Fatigue with repeated use may perhaps be a factor, though equally it may not. Being circular in shape, the rings feel quite strong, however I wonder about something like a heavy textbook being dropped on the spirals — which I guess you’d never know until it happened. 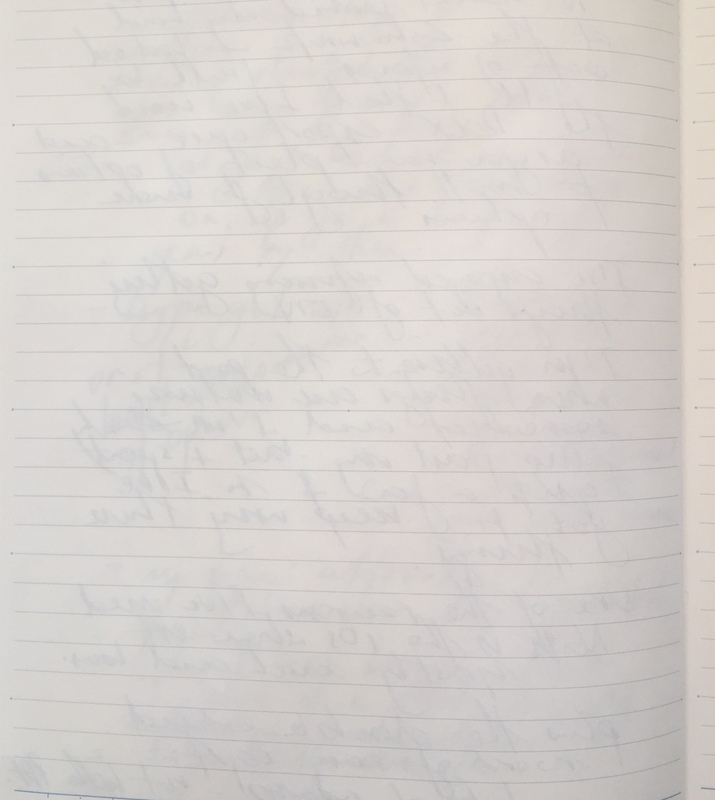 My other main quibble, which isn’t unique to this particular product — more so with spiral bound notebooks in general, is the inevitable “page wiggle” which occurs while I’m writing. Unless the pages are a fairly tight fit on the binding, which tolerances generally prevent — I find myself needing to hold the page steady rather than simply resting my free hand on or beside the notebook. Not a big deal however I do find this a little annoying to constantly do. With a packet of grid refills, I’m planning on using this as a recording notebook for my coffee roasting. Perfect. Although this post is not intended to be a head to head comparison of the three products I have described above, I have certainly come out of the experience a little more knowledgeable on the merits of each. Also worth mentioning in addition to those above, is the “X” branded spiral notebook from Officeworks which I have previously written about. To be honest, I would buy and use all three again. One thing is for certain though, the B5 Complete Report Pad is now my default for written correspondence. I love the size, the paper is great, and sheets tear off with ease. A definite ongoing purchase when the current one runs out. 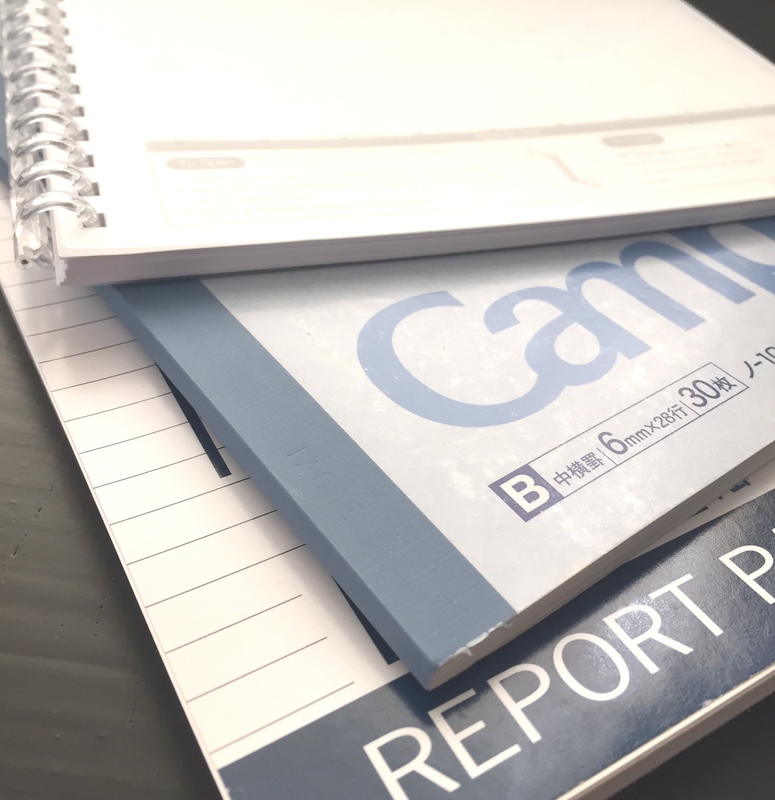 Of the other two, the Campus Notebook slightly edges out the Aqua Drops, and appeals mainly based on the quality of paper and overall lightweight yet quality construction. 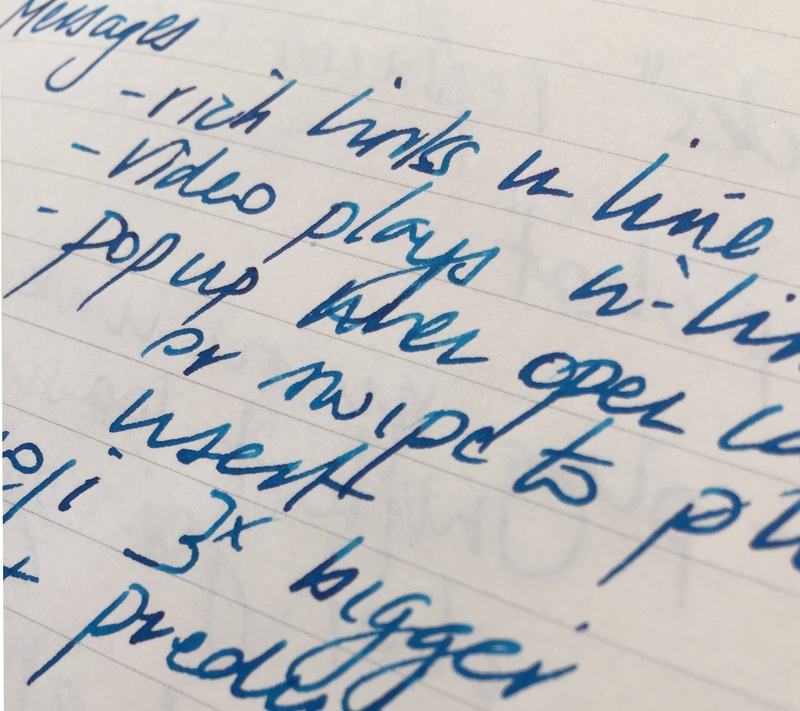 The Aqua Drops notebook series I consider a solid option, and for me, would be an ideal “project” notebook, as the option to add, subtract, or rearrange pages (of ruled, plain or grid options to boot) is a real positive. A few sketches and notes as part of a project negates the ongoing “page wiggle” issue of prolonged writing sessions, and tends to be where a lot of spiral bound notebooks I try end up. As I mentioned above, I do find satisfaction in seeking out lower cost stationery options, which, admittedly aren’t always on point, however the three above are great options to try out for yourself. If they don’t suit? Well, I guess you haven’t really lost much in finding out. 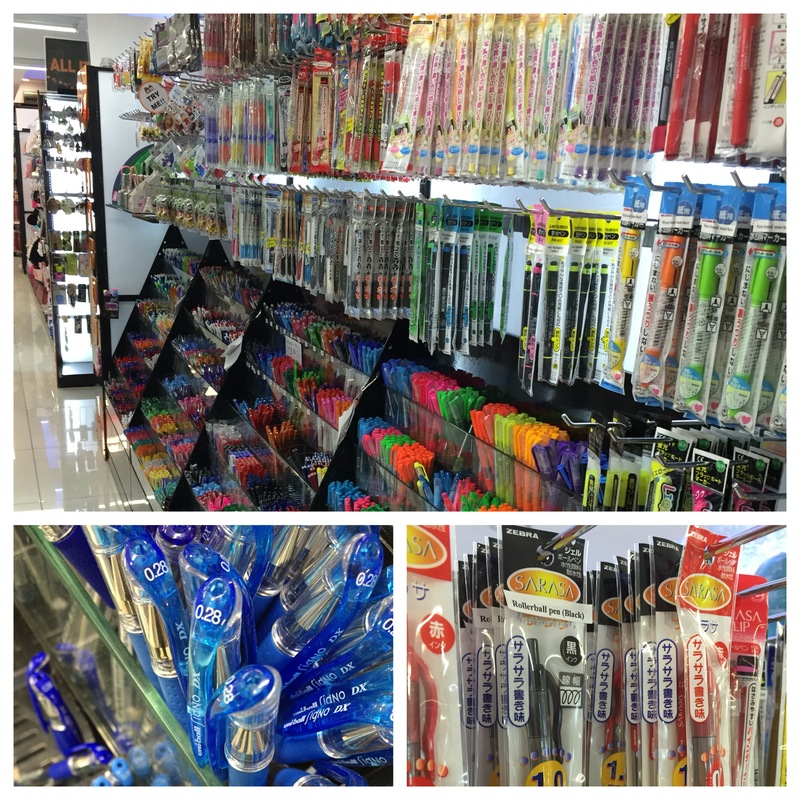 Although not likely to replace your favourite online stationery supplier, nor is it Officeworks, Japanese discount store DanDa has a few options which might be handy to those interested in pen and paper. Cheap, locally available, and carrying some items not found in other brick and mortar stores in town all make for a place worth visiting next time you find yourself in the Brisbane’s CBD. Located in Adelaide Street (opposite City Hall), it’s an easy walk from most places you may be visiting should you find yourself in the CBD. What might you find here which may be of interest? Quite a few gel pens for starters, including Uniball’s Signo DX, some Zebra’s Sarasa, Pilot’s G-2, and Pentel’s Energel among many others. The predominant tip size is medium and finer, although for those who prefer a wider line you will likely find something for your preference as well. 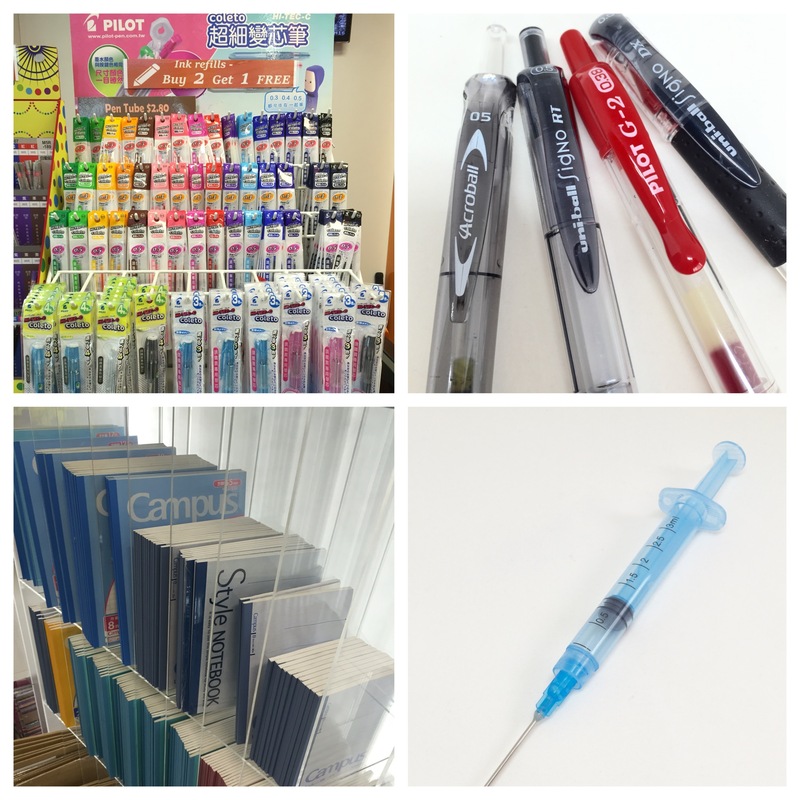 DanDa has been my go to supplier for Pilot Hi-Tec-C Coleto multi-pen refills for some time now, and if you buy three refills, you only pay for two. Speaking of payment — it is of course one of those stores where everything is a universal price (apart from the occasional item marked otherwise – though this is rare). Everything you pick up is A$2.80. For the fountain pen user? Here, there is probably a little less (read zero) as far as pens are concerned, however I have picked up the fountain pen friendly Campus notebooks by Kokuyo (in multiple sizes); a 3 ml syringe for cartridge refills (you’ll find this in the cosmetics aisle); and a couple of magnifying glasses (albeit not the most powerful) for peering a little more closely at some nibs. Again all at a cost of A$2.80 a piece. 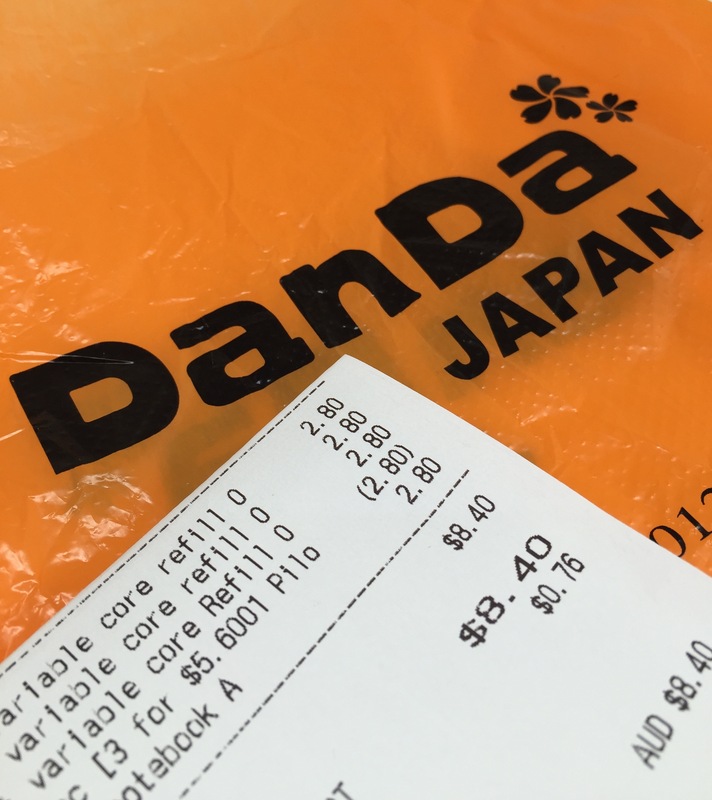 As I said, DanDa probably won’t become your go-to stationery store, however there are a couple of aisles of pen and paper well worth checking out — and it certainly won’t do your credit card too much damage in the process.